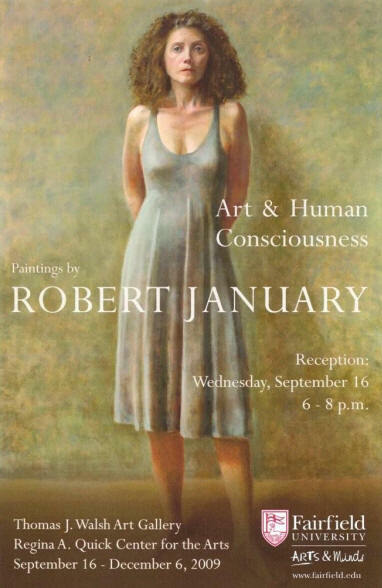 FAIRFIELD, Conn. (Aug. 17, 2009) “Art & Human Consciousness,” a solo exhibition of paintings, drawings and photography by internationally recognized artist Robert January opens at the Thomas J. Walsh Art Gallery, Regina A. Quick Center for the Arts at Fairfield University on Wednesday, Sept. 16 with a public reception from 6 to 8 p. m. The artist will attend the opening. A forty-page illustrated color catalogue including an essay from Fairfield University Professor of art history Philip Eliasoph accompanies the exhibition, which continues through Sunday, Dec. 6, 2009. Admission to the gallery is free. The Gallery will sponsor a conversation about the exhibition on Thursday, Sept. 17 from 12:30 to 1:30 p.m. January will discuss his work and Dr. Jean Clottes, eminent expert on cave painting and rock art and Mille, will join him. On Friday, Oct. 23 from 12:30-1:30 p.m. in the Gallery, neurologist and author, Dr. Frank Wilson will relate his lecture, “Coming to Grips with the Human Hand” to January’s figural works. Admission to both events is free. January’s work has been exhibited by invitation each year at the Salon d’Automne in Paris since 2004. This annual Parisian event, first staged in 1903, was a springboard for the careers of Cezanne, Picasso, Matisse and Maillol. Last year, January was voted in the Salon d’Automne as a societaire or guild member, with voting rights on how the Salon is managed. Admission to the gallery is free. The hours are: Tuesday-Saturday 11 a.m. to 5 p.m., Sunday: Noon to 4 p.m. Closed Monday. The gallery is always open when performances occur at the Quick Center.